Road Line Pin. 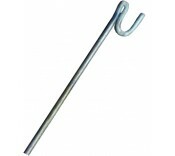 This road line pin used in road forming and is manufactured from heavy duty stee..
Road Line Pin. This road line pin used in road forming and manufactured from heavy duty steel. ..
Road Line Pin. This road line pin used in road forming and is manufactured from a heavy duty st.. Non Conductive Road Line Pin Eliminates the risk of the user striking an underground power cabl.. Non Conductive Road Line Pin. Eliminates the risk of the user striking an underground power cab.. Insulated Line Pin​ An alternative to the steel road pins. The insulated road pin elimi.. Non Conductive Fencing Pin 1.3m x 12.7mm Easy Push Foot Plate No Scrap Value .. These fencing pins are usually used with hazard warning tape, rope or barrier netting to fence of..
A highly visible plastic cap for safety when using rebars Increases workers visibility of rebar.. Helping work site managers and construction crews outline sites and form temporary roads and routes – the fencing and road line pins selection from Manchester Safety Services have been designed to be incredibly simple to use. The materials and designs of the pins have been carefully planned to assist with their primary purpose whilst offering a selection of secondary functions. The range has a wide selection of varied pin designs – suitable for various tasks and responsibilities. All produced by trusted manufacturers, using high quality materials – the range is made up of robust and durable pins. From fencing pins to plastic mushroom caps – the range is suitably varied to help accommodate different tasks. If you require additional assistance selecting the fencing and road line pins which are best-suited to your specific needs – please contact Manchester Safety Services’ dedicated customer services team on 01706 364943 and we will endeavour to help in any way possible.